With a passion for the automobile that started in his childhood, Michael has chosen to focus his artistic talent on capturing American muscle and sports cars in vibrant, high impact watercolor. His unique approach to this traditionally 'loose' medium, and ardent eye for detail produces crisp, sharp images that are alive with color and narration. Michael’s use of reflective surfaces and ‘hidden’ images along with his incredible attention to technical accuracy, make his car art paintings highly captivating. His goal is to draw the viewer into the scene while slowly revealing more of the story before them. Incredibly detailed, powerful, imaginative and creative, the surrealism of Michael's work invites you to join him in a journey of discovery. Asked why many of his early paintings feature the Ford Mustang, Michael responds, "My first car was a Mustang, so was my 2nd, 3rd and 4th. I really like it’s aggressive, ‘go fast’ look, with it’s clean lines and chrome accents." Although his portfolio might seem to favor Mustangs, Michael likes and appreciates all American muscle and sports cars. He has owned a 1973 Camaro and currently has a '71 Firebird Formula in his collection. Michael admits that when space allows, he'd like to add a 1969 Camaro, '69 Mach 1, 2008 Bullitt Mustang, '68 Charger, '70 Challenger and the new Dodge Challenger, just to name a few! Michael received his first art scholarship in Grade 2 and from this early interest it was natural for Michael to gravitate toward a career in art. With a strong focus on commercial illustration, he graduated from the Graphic Design program at Grant MacEwan College in Edmonton, Alberta. His use of watercolor, together with his background in architectural illustration, incredible talent, and his love of classic cars, have proved instrumental in developing Michael's passion for automotive art. In 1994, he released his first print, Evolution of a Legend, in commemoration of the Mustang's 30th anniversary. Over the next 12 years, while having a successful career as a commercial illustrator, Michael continued with his automotive paintings. In 2006, he decided to give his true passion his undivided attention, and now focuses on his automotive art full time. With each new painting, and series, Michael continues to push the envelope creatively. His work is dynamic and diverse. Some of his recent releases include "The Competition Has Arrived", "The Champion", "Found Room For Two More" (the second painting in his unique GM Trilogy), "Helluva Mirage", and completing the incredible GM Trilogy, "Make Room For Three More"! Michael attributes much of his success as a fine artist to his wife and partner Linda, and to a select group of dealers of his artwork. It's their combined efforts that allow his art to, not only be available in his online gallery, but also to be seen in person at numerous events, such as automotive auctions like Barrett Jackson and Mecum, as well as other car shows across North America year round. Michael lives in Southern Ontario with his wife and their two children. Focussing on his automotive art full time has allowed Michael the freedom to enjoy his family as well as the collector car hobby. 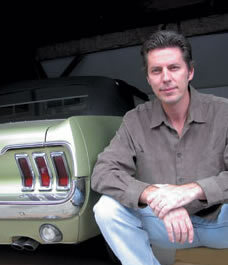 He spends some of his leisure time attending car shows and other automotive events, driving his lime gold 1967 Mustang GTA convertible and 1971 Firebird Formula, and occasionally working on the other cars in his collection. —Michael on where his ideas come from.